Last words are a person’s final articulated words, stated prior to death or as death approaches. It can also be the last public statement or something written in a note or a will. Often, the last words have an aura of mystery and sometimes they are made up by others. 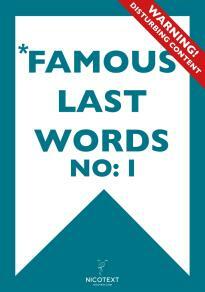 All the quotes in this book are alleged last words – they might not be true.